The World That Tao Rules – Book 1 Released on Amazon! The Hunter Under the Tree of Origin – Book 2 Released on Amazon! The Hunter Under the Tree of Origin – Book 1 Released on Amazon! Update regarding The Great Conqueror! Should we pick up “The Crimson Dragon” again? Join Our Team as an Editor or Translator! Starchild Escapes Arranged Marriage – Vol.3 Released on Amazon! Guoyan seemed to fear the youth who had spoken. But he still continued to stare at Su Yi coldly. Su Yi observed the dignified youth. He looked calm and peaceful but something about him made Su Yi feel uncomfortable. “Let us move on. We need to make it to the rendezvous point and meet up with everyone else as soon as possible.” The lady which was called Junior Sister Bi Ling said. She smiled at Su Yi and left. The others followed the lady and went off as well. Guoyan then turned around and did not care about Su Yi anymore. Su Yi smiled bitterly. He did not want to make any trouble for himself as well. From the actions of these few youths, they were definitely from a major sect or school. They were most likely training or there may be strong cultivators nearby watching over them. He may have Fire Bird and Snow Ape by his side, but it was best that he did not invite any more trouble. If he could tolerate the matter, then so be it. “That person was quite strange, he sure did have quite the courage. He was looking at Elder Sister Bi Ling the entire time.” Far away, there was a sound of a young girl. It was the other lady teasing the girl called Bi Ling. “Junior Sister Yiyun, he was obviously looking at you.” Bi Ling said. “Elder Brother Guoyan, Elder Brother Zhouda, we should hurry and remain cautious.” Bi Ling’s voice started to fade away. Su Yi shook his head. His spiritual energy had risen quite a bit. These voices nearby would not be able to escape his ears. Suddenly, Su Yi’s expression changed. He had felt something coming. In the trees up ahead, there were sounds of rustles of leaves approaching him. Then, there were the deafening howls of beasts and three Hell Wolves lunged out of the bushes and stared at Su Yi. But in an instant, the three Hell Wolves seemed to have sensed some sort of aura and their approach ground to a halt, not daring to take another step forward. Looking at the three Hell Wolves, Su Yi raised his eyebrow. He was not surprised, rather he was delighted. The adventurer party was still relentlessly searching for him. Among the trees, there were voices of anxiety and seemed like there were a couple of figures rushing towards Su Yi. He initiated the “Chaotic Yuan Supreme Technique” and then, there was an aura of authority spreading through the place. In the blink of an eye, the three Hell Wolves were prostrating on the ground. Their eyes filled with fear, their bodies trembling. Su Yi looked at the three Hell Wolves, a crimson color flashed in his eyes. He turned and left, rushing in a particular direction. The five youths walked through the forest quickly. Suddenly, there was a howl. The five youths immediately turned their heads, their eyes filled with caution, their faces changed in an instant. But when they turned around and saw only three Hell Wolves, their faces relaxed a little. These five people were the ones which Su Yi had ran into. When they saw Su Yi who was running towards them, they all looked surprised. Su Yi saw the five people that he had caught up to and slowed his steps. He smiled and waved his hand forward, signaling the Hell Wolves to lunge after them. His eyes harboring some evil intentions. The three Hell Wolves lunged forward, not giving a care about themselves. Their teeth bared and their aura fierce. The face of the person called Elder Brother Qingfeng fell. He took the lead by stepping forward a few steps. 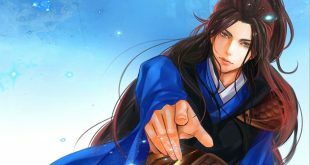 A strong aura burst out from him, his Yuan Qi came out of his body and formed a palm seal, together with a complicated body technique, he went to strike one of the Hell Wolves. At the same time, Guoyan and Zhouda both stepped out as well and attacked the Hell Wolves. Though the Hell Wolves were not weak, they were only at Demonic Soul Realm cultivation level. Any of the three young males would be stronger than Ji Chao whom Su Yi had fought against in the City of Man. Their movements were skilled and swift. Their auras strong and their martial art techniques were not average as well. “Bang! Bang! Bang!” In just a few moments, the three Hell Wolves were already dead. After he had killed the Hell Wolf in front of him, the eyes of Guoyan turned cold and locked onto Su Yi. Not talking about Guoyan, no one else had expected Su Yi to actually bring three Hell Wolves to attack them. No greetings, just a straight attack. “What? Just with the few of you? My men are arriving soon. If you have the guts, don’t try to run. If you decide to kneel before me and kowtow three times, I can spare your pitiful lives.” Su Yi looked at the three young men and said casually. How could Guoyan tolerate this? Even within the sect, their positions were still extremely high. They were Inner Disciples. Even when they went out, they were still respected by everyone. When have they ever been insulted and looked down upon by such a pathetic looking kid? Once he finished his words, he immediately lunged towards Su Yi. Seeing Guoyan heading towards him, Su Yi turned tail and ran at once. Though he had a 500-kilogram sword on his back, Yuan Qi swirled under his feet, his speed was not slow either. Seeing Su Yi running away, Guoyan chased after him. How could he let Su Yi go? Zhouda and Qingfeng saw the situation. They were also fuming and went chasing after Su Yi as well. Bi Ling and Yiyun looked at each other, still in a slight daze. “Let’s watch out.” The two girls were worried and could only follow the boys. Several figures came dashing forth, their weapons drawn, and an air of bloodlust surrounded them. The Hell Wolves had found something. It must be that kid. During the period of time where they were looking for the kid, everyone had suffered. Furthermore, if they caught the kid, Black Fiend School would pay them a hefty sum. No one wanted to miss out on that reward. They had wasted all their time on this kid during this journey into the Forest of Demons, naturally, they must receive an adequate reward for their efforts. If you have found any mistakes in the translation, please, notify us by selecting that text and pressing Ctrl+Enter. List of Supporters, Keeping us alive!